That pine tree air freshener has served its purpose. It’s time to take it down and replace it with an essential oil diffuser. With a diffuser or a nebulizer, you’ll have a more intense experience that you can customize to meet your needs. Then you can enjoy the benefits of aromatherapy on the road. 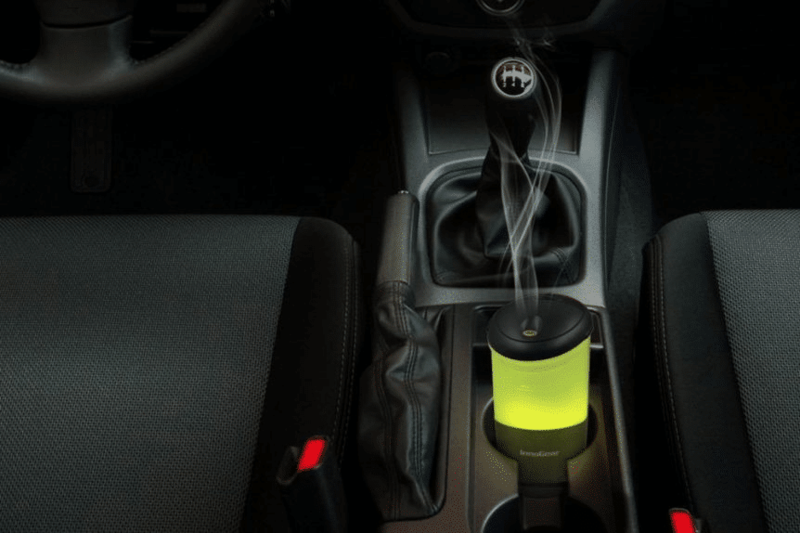 We discovered the eleven best essential oil diffusers for cars and reviewed them here for you. We know our readers are serious about their well-being just like supermodel Gisele Bundchen. She uses essential oils, too. So if you’re feeling stressed about the long commute ahead, enjoy a mix of lavender, geranium, and bergamot. And if you’ve got a cold, try eucalyptus, peppermint, and frankincense to feel better faster. After you find the perfect portable diffuser, check out our article on essential oil starter kits to begin making your own blends. InnoGear’s USB car diffuser is our top pick for five reasons. Its primary benefit is that it runs off a car charger, the same kind you’d use to top up your phone. Although it doesn’t come with a cigarette lighter adapter, there is a USB cable in the box, and it should fit any charger you already have. Second, the body of the diffuser fits neatly into a cup holder. It holds 50mL of water, or enough to keep the diffuser operating up to six hours. Third, the plastic container is free from BPA, so no toxins leach into the liquid. And when the diffuser runs out of water, it shuts off automatically. Fourth, the control buttons are located on the top within easy reach. Although the device has a 7-color LED light, you can turn that off if it’s distracting. The buttons also allow you to switch between continuous and intermittent mist modes. And the fifth and final highlight is that InnoGear offers a 45-day money-back guarantee and a 12-month warranty. It’s basically a no-risk purchase. Syntus’ USB essential oil diffuser for cars is similar to the one from InnoGear. Like that other diffuser above, this one fits into a cup holder and runs off a car charger. But this one fell in the 2nd place because the manufacturer does not state whether the plastic is BPA-free or not. Like many portable diffusers, it comes with a USB cable but no car charger. You can also run it off the USB 3.0 port of a laptop or PC. The control buttons on top allow you to turn it on and off, choose between intermittent and continuous misting modes, and control the mood light. And if you fill it with water to the 50mL mark, it can operate up to 6 hours. Up to this point, we’ve reviewed ultrasonic essential oil diffusers that require water to function. But not everyone wants to humidify the interior of the vehicle. As a result, we chose the Skey Touch Nebulizer to include in our reviews. It only requires a few drops of pure oil to operate. The internal rechargeable battery runs off any 5V USB connection as long as it provides at least 1A of current. This feature allows it to run off either a car charger or the USB port of a PC or laptop. On a full charge, the diffuser runs up to 10 hours, but it automatically shuts down after 2 hours of operation. Plus, users comment that the Skey Touch is quiet while it’s working. The ZAQ Tour Litemist is a popular car diffuser that comes with its own cigarette lighter adapter and an AC adapter for home use. It cannot run off USB cable from a car charger. That’s because it requires 8W with 12V DC to operate, not the typical 5V from a lighter socket. The BPA-free reservoir holds 60mL of water, and that allows the diffuser to operate up to 5 hours at a time. If the water gets low, the device shuts down automatically. Plus, the top cover locks into place to avoid spills from tipping. Finally, ZAQ offers a 1-year limited warranty. While Airror sells at least two kinds of car diffusers, we chose the one with a proven track record. The BPA-free reservoir fits neatly into the typical cup holder of most vehicles. It holds 55mL of water to run up to 6 hours. And it operates in either continuous mist or interval modes. Like most diffusers of this type, it will shut down automatically when it runs out of water. Since it’s powered by a USB cable connection, you can plug it into a computer or a car charger. There were a couple of details that we noticed about the Airror diffuser. One is that the power button is on the side, not on the top for easy access. And two, there’s no clearly marked fill line in the reservoir. For our concluding review, we chose the waterless mini oil diffuser from AromaAllure. It’s not an ultrasonic humidifier, and it’s also not a nebulizer. It’s simply a little battery-operated fan-powered air freshener. To enjoy this diffuser, you’ll want to plug it into a car charger with the included USB cable or run it off 3 AAA batteries. It’s small enough to fit in most cup holders. The decorative wooden lid and soft light could make your drive home a zen-like experience. Once you’ve added a few drops of essential oil to the microfiber pad inside, the diffuser will run up to half an hour on battery power or indefinitely when plugged into a charger. The fan inside draws air up from the bottom and pushes it out the small hole in the top. Users report that the fan is quiet, but the diffuser doesn’t release much aroma. That’s not necessarily a con if you’re not a fan of overpowering scents. Aromatherapy is proven to improve mood, plus it has other beneficial effects on health. The small cost of one of these portable diffusers is very little to pay to enjoy your favorite essential oils in the car. Plus, they are compact enough to take on vacation, too. we are specialized in car solid aromatherapy,if you like,contact me soon so that I can show you several photos.